Home > Blog > Blog/News > Not in Vain! Poor Sisyphus. He crossed the gods, and is still paying for it (that is, if you believe in Greek mythology). He is forced to roll a massive boulder up a hill. But just before he reaches the top, the rock gets away and rolls down all the way to the bottom. So he must begin the work over, straining to push the stone upward, only to see it tumble down again. And then up again, and down again. And again, and again, and again, forever. This was the unbearable hell (as though there is any other kind) imposed on Sisyphus: an eternity of fruitless, futile, and utterly meaningless toil. We feel his pain. Ever since Adam and Eve were cast out of the Garden, where their work was always fruitful and satisfying, our labors in this sin-cursed world are often frustrating and seemingly wasted. Like Sisyphus, at times we suffer the agony of unproductive toil (for me, whenever I attempt a household repair). And in the face of our own mortality, and in light of the fact that time has a way of scrubbing even our most enduring accomplishments, we wonder what lasting value our work has at all. 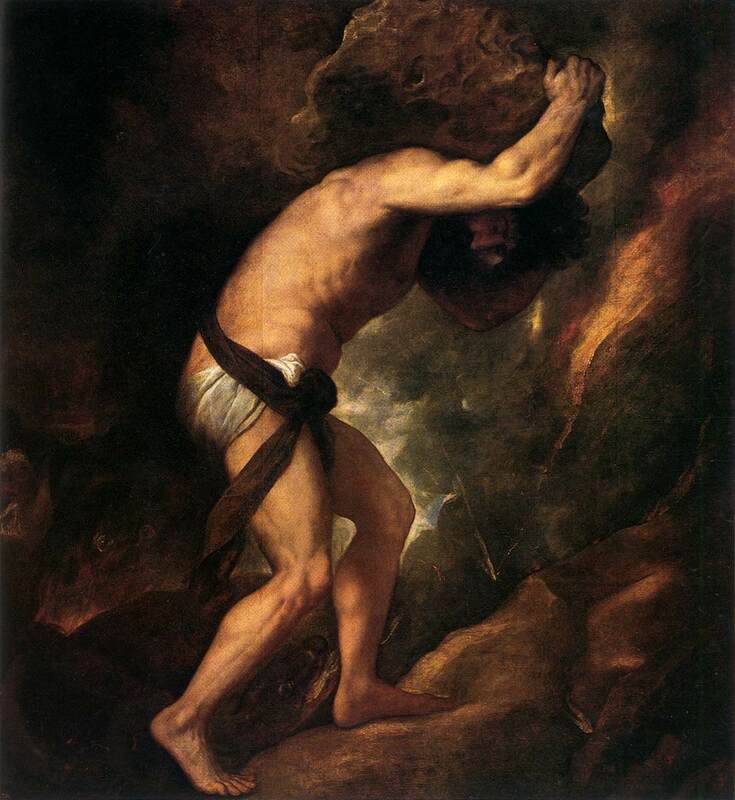 Sisyphus would have found a kindred spirit in Solomon, who asked, “What does man gain by all the toil at which he toils under the sun?” (Ecclesiastes 1:3). That’s a rhetorical question – the answer is “nothing”. And so Solomon cries out, “Vanity of vanities,… vanity of vanities! All is vanity” (v.2). There is mystery in these words. It is a mystery bound up with the incarnation – Jesus was fully God, yet his experience as a man was fully human. And what man, having been betrayed by one friend and abandoned by the rest, having been rejected by his own people, dying on a Roman cross, completely alone, would not think his time on earth had been all for naught – “I have spent my strength for nothing and vanity”? Again, these words are enigmatic; they defy a facile explanation. But, we can say part of the suffering Jesus endured in his earthly ministry was the pain of seemingly wasted effort. After three years of exhausting, conflict-ridden, painstaking ministry, it seemed there was precious little fruit to show for it. But there was more than meets the eye. Of course no sane person would have looked at Jesus on the cross and said, “There is a man doing a great work.” Yet it was on the cross that Christ brought to completion the greatest work ever accomplished: redeeming a people from sin and death forever. Isaiah goes on in his prophecy to say of Christ: “Out of the anguish of his soul he shall see and be satisfied” (Isaiah 53:11). The suffering and death of Christ seemed fruitless to human eyes, and in some impenetrable way, even to Jesus himself. Yet the result was resurrection for Jesus, and eternal life for sinners. And Jesus is satisfied with the fruit of his labors. And for those who belong to Christ by faith, God promises that work done in his name is never fruitless. “Therefore, my beloved brothers, be steadfast, immovable, always abounding in the work of the Lord, knowing that in the Lord your labor is not in vain” (1 Corinthians 15:58). The missionary who spends forty years in Japan and sees only a handful of conversions? His labor is not in vain. The small-church pastor who for two decades pours himself out for the flock, only to see the church dissolve at his retirement? His labor is not in vain. The mother who devotes herself to her child, loving him with prayers and tears, only to see him walk away from the faith? Her labor is not in vain. Christian, have you tasted the bitter frustration and heartbreaking discouragement of seemingly wasted time and effort in your service for Christ? Know that God hasn’t given you a sisyphean task. But, like the very work of your Savior in his suffering and death, it may be your strength spent on “nothing and vanity” that produces the best fruit for God’s glory.